Jane Aaron was an internationally-recognized artist, award-winning animator, and best-selling children’s book illustrator and author. Jane was a pure artist, who was devoted to her art, and to progressive values especially those of importance to children and to women. Jane’s seven independently-produced experimental animations, compiled in the half-hour ”Aaronimation,“ are quintessentially cinematic. They explore qualities unique to pre-digital movie-making with her own handmade production tools and techniques. The works capture an era of 16mm filmmaking that is now frozen in history by obsolescence of the film medium. Seen as a series, the viewer observes and understands the development of an artist’s techniques from one idea to the next, over several years. Each film is its own separate gallery show of individual shots animating in different ways. They also are each filmed in a variety of intriguing interior and exterior locations. Yet they share a clear commonality of the artist’s taste, style and thinking. The films’ experimental soundtracks of commissioned music and audio effects design were collaborations with musicians Larry Packer, Richard Grando, and Steely Dan’s Donald Fagen, and sound mixers Lee Dichter and her brother Andy Aaron. The films, now on the web http://www.ExperimentalAnimationsbyJaneAaron.vhx.tv, have been seen on PBS, HBO, Showtime, Cinemax, The Learning Channel, on Canal +, Danish, Australian, and other TV networks internationally; in many museum permanent collections, including Metropolitan Museum of Art, Museum of Modern Art, Hirshhorn Museum, Walker Art Center and Exploratorium; in public screenings around the world including at the Whitney Museum of American Art Biennial and Museum of Modern Ar Cineprobe; at Animation Festivals in Annecy, Zagreb, Ottawa, Bristol, Toronto, Stuttgart, and Hiroshima; at the New York, London, Edinburgh, Sydney, Telluride, Filmex, Sinking Creek, and Tribeca Film Festivals, and many others. They have won many awards including ASIFA Award, Best of Zagreb, and prizes at twenty other festivals. As a collaborator with the 1970s production group Videofreex, Jane participated in weekly live Lanesville TV pirate broadcasts in the upstate NY Catskill Mountains; with TVTV she crewed at the Superbowl; with Skip Blumberg on productions at a Thai elephant rodeo, in Alaska at the Eskimo Olympics, in Lake Placid at the Winter Olympics, in NYC at the double Dutch tournament; and as a member of production group Image Union, Jane was collaborator for 2 live and videotape cable TV series, “Five Day Bicycle Race” and “Mock Turtle Soup,” including constructing her hand-drawn TV studio sets. Jane was a John Simon Guggenheim Memorial Foundation Fellow; a recipient of grants and fellowships from American Film Institute, Jerome Foundation, National Endowment for the Arts, NYS Council on the Arts, Short Films Showcase, and Creative Artists Public Service; as well as an appreciative Fellow of the MacDowell Colony four times, for which she also served on the Executive Fellows Committee. She served on the jury at animation festivals in Annecy, Hiroshima, and Toronto. Aaron was visiting artist and teacher at New York University, Rhode Island School of Design & Engineering, California Institute of the Arts, Ohio Arts Council Summer Media Institute, American Cultural Center (Paris), University of Hawaii (Manoa), Fairbanks Alaska Arts Council, HIgh Museum (Atlanta), Virginia Museum, Survival Arts Media, Ossining Elementary School, Art Awareness (Lexington NY), Mid Hudson Libraries, Chinsequet Film Conference, Wexner Center, Columbia (SC) Museum, Ohio Teachers Association (keynote address), and others. Jane had a natural talent for delightfully communicating to kids. Her films take a clear route to young viewers’ minds and imaginations, especially pre-k and beginning readers, backed up by exemplary analytics from all of her films, which ere tested by Sesame Workshop (with two exceptions). Aaron designed, produced and directed more than 200 short animated films for Sesame Street. Her signature spinning ABCs and numbers arising from city streets, stoops, and rooftops, visual staples on the series for many years, are still widely remembered. Many are seen today uncredited on www.SesameStreet.com. Jane Aaron was the author and illustrator of “When I Feel...," a series of 4 children’s picture books published by Golden Books about emotions (anger, sadness, jealousy, fear). The books contained companion booklets to advise parents. HBO Family commissioned Jane to translate the four books into a series of animated shorts, plus four additional emotions (loneliness, happiness, being funny and pride). She also completed an animated series for HBO Family, “Just Wondering,” six shorts from original material that she wrote and illustrated, which aimed to generate kids' and adults' curiosity, more than to provide answers or facts. Aaron illustrated Little, Brown’s New York Times #1 bestseller "No More Secrets for Me" written by Oralee Wachter, based on Wachter and Aaron’s award-winning, internationally-acclaimed animated film for children, which offers sensitive preventative information for children on sexual abuse. The film and its companion book have been used in countless U.S. school systems and throughout the world. It was followed by "Close to Home" (Scholastic, Inc.), another successful book collaboration between Wachter and Aaron. At the end of her career, with her long-time songwriter collaborator, "Sesame Street"-co-founder Christopher Cerf, Aaron co-produced the Homelink DVD Series of early childhood learning programs for noted educational foundation Success for All, as well as co-produced Think Smart Games’ app, “The Animal Alphabet Singers.” Cerf had previously written songs and produced sound mixes for several dozen of Jane's "Sesame Street" shorts. 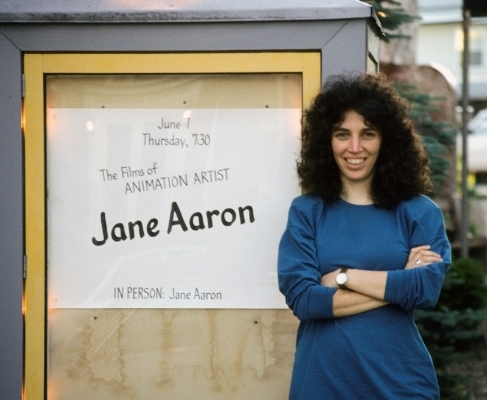 Jane was a prolific visual artist with many existing hand-made props and installations for her films, and hundreds of drawings, objects, and other artwork in the Jane Aaron Collection. Having assisted independent animators Eli Noyes, Maureen Selwood, and others, Jane was active in an informal group of indy NY animators in the 1980s, in the Women’s Action Coalition, and most recently in a movement for children’s nutrition, including proposing an ad campaign for outdoor signage in neighborhood deli’s, bus shelters and billboards. Aaron was honored as the 1996 Distinguished Alumnus of the Year at her alma mater Boston University’s College of Fine Arts, where she had received her BFA in sculpture. She graduated from NYC’s High School of Music and Art, now LaGuardia High School. She was President of In Motion Productions, Inc. and Chief Art & Design Consultant for Sirius Thinking Ltd.
1979 Pittsburgh Film-makers Co-op, group show. 1981 Animators’ Gallery, NYC, one-person show. 1981 Night Gallery, Woodstock NY, one-person show. 1981 Zone Gallery, Springfield MA, artists’ books. 1981 Neuberger Museum, “Soundings, Visual Artists’ Use of Sound,” group show. 1982 Montreal Museum of Fine Arts, “Art of Animated Film,” travelling group show. 1984 Vanderbilt University Art Gallery, Nashville TN, one-person show.